As you might imagine, 'The Grinch' is a popular name for green cocktails. The name has been used quite often over the years, typically for holiday drinks though any of these can be enjoyed year round. The namesake for all Grinch cocktails is, of course, Dr. Seuss's classic holiday character. 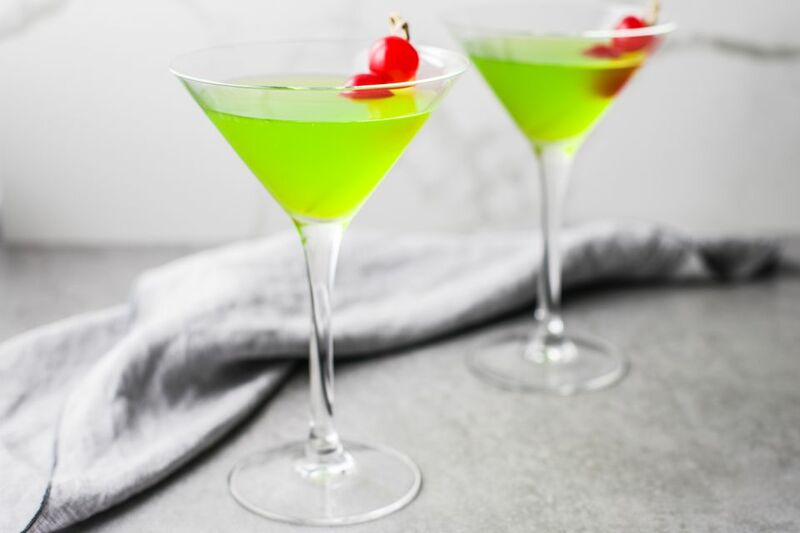 In true Grinch fashion, the drinks are green and are garnished with a cherry, strawberry or other red fruit to represent the character's heart. Just like the story, any of the Grinch cocktails is sure to improve your mood. Though they vary greatly in flavor, each of the three recipes we have included below is incredibly tasty. Which you choose will depend on your personal taste and mood. Have fun with these and find a little of that Christmas cheer! Among all of the drink recipes that have taken on the name 'Grinch,' this is what we may call the original. It is the Grinch recipe you will find in almost every bartending guide that lists the drink and it has been a favorite since the first days of the vodka martini craze. It is also the basic recipe for a Midori Sour. The mix is very simple and the drink can be very sweet if you use too much syrup. Almost every Grinch cocktail includes Midori or a similar green, melon-flavored liqueur. That alone is sweet and is offset by fresh lemon juice. The syrup is added as an accent to Midori's sweetness. Be sure to start small on the syrup, particularly if you are using a rich 1:1 syrup or a store-bought brand. Over the years, the Grinch has often had vodka added to it. It is the perfect way to add a little kick to this popular melon-flavored cocktail without messing with the flavor. When adding vodka, we would recommend this pour: 1 1/2 ounces Midori, 1-ounce vodka. If you do want to add a little flavor to the drink, choose a flavored vodka. Cucumber is a perfect pairing for melon and citrus vodkas are a nice, subtle accent as well. A complete turn from the 'original' Grinch, only the green color and the Midori remain in this fun and cheap) rum cocktail. This Grinch has a much more tropical flare and it is ideal for those warmer days when your mood needs a little softening as well. The mix of coconut, banana, and melon is a hard one to resist. This Grinch is tempting and it is very easy to mix up. It can be one of those casual sippers to enjoy anytime you want something sweet and refreshing. If you like, pour this cocktail into a tall glass and add more soda to extend your enjoyment. To make this drink, pour 1 ounce each Midori, coconut rum, and banana liqueur into a cocktail shaker filled with ice and shake. Strain into an old-fashioned glass with fresh ice, add a splash of lemon-lime soda and garnish with a cherry or strawberry. Beyond Midori, what is the other popular green liquor we all know and love? Absinthe, of course! The two emerald spirits make an appearance together in this very interesting Grinch recipe. You might not think that the anise flavor of the notorious absinthe would work well with sweet melon and this drink will prove you wrong. It's a nice change from the sweet, fruity profile of the other Grinch recipes and adds depth to the flavor. We would say that if you are a fan of classically-styled cocktails and shy away from sweet martinis, then this is the Grinch you should try. It is served tall and that ginger ale really balances out the two contrasting flavors. To make this drink, build 1-ounce absinthe, 1 1/2 ounces melon liqueur, and 1/2 ounce lime juice in a tall glass filled with ice. Top with ginger ale and garnish with a cherry. How Strong are These Grinch Cocktails? To put these number into perspective, the average Cosmopolitan cocktail weighs in between 20 and 28 percent ABV. Will It Be a Friar Tuck No. 1 or No. 2 Tonight?